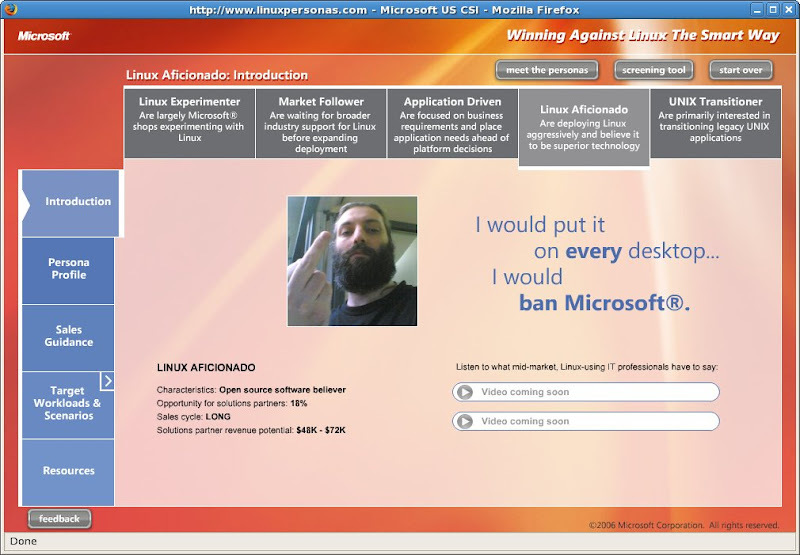 Winning Against Linux is a site where Microsoft identifies Linux users as personas, along with the ways to convert us to using their products and even the money they think can get. Awesome! I modified in the screenshot just one small detail, for increased realism: the user photo. PS: so they fight if they feel the need need to win, the conclusion is that we have just one more step. Hahaha, that's an awesome profile picture. I'm pretty amazed at microsoft actually publishing a site like this. As opposed to keeping it as internal marketing material. Like you said, looks like a good sign. This material is being updated and will be made available to Microsoft partners shortly. Nicu! They must be reading your blog! Did anybody download the presentation who can mirror it? Yes, I have a copy of the presentation, contact me directly. I will not post it online by myself as I am not sure about its copyright status.